Tom and Bethany Alkazin are the Nr. 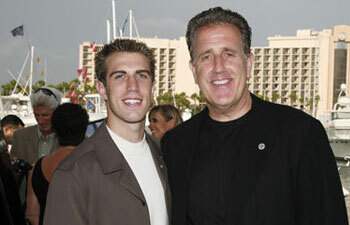 1 Top Earners – Royal Ambassadors in Vemma and high ranked in the Hall Of Fame. 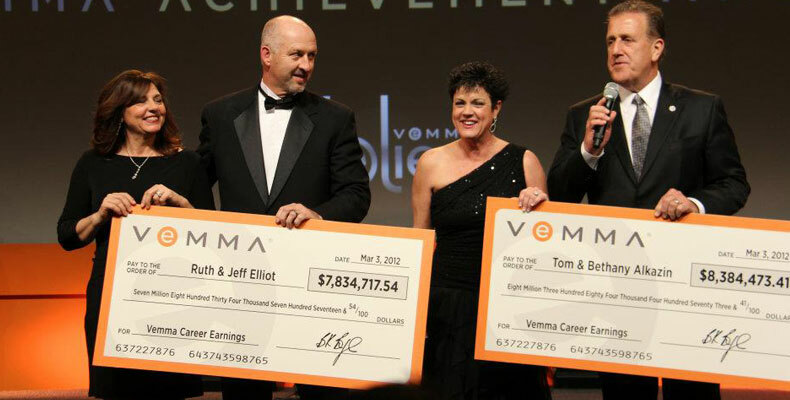 Tom and Bethany made $8.3+ million with their Vemma distributorship. Their Life Time MLM Earnings are $16+ million. They live in a 6,000-square-foot home in Carlsbad, California, USA, near the Pacific Ocean, with a separate home office, guest house, swimming pool and basketball court. 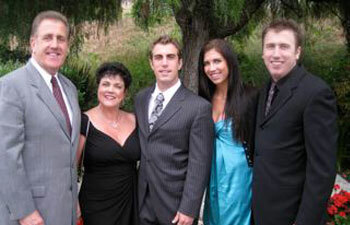 They have 2 sons, Chris and Brad, and 1 daughter Amy. In Tom and Bethany's group are very successful leaders like: Jeff and Elizabeth Hooks (USA), Peter and Marie Francis (Australia), Martin Ruff (Netherlands), JD and Ronni Phillips (USA), Dave and Kim Rasmussen (USA), Brad Alkazin (USA), Billy McSwain (USA), David and Wendy Graham (USA), Linda Proctor (Canada), Lanny and Deena Morton (USA) and many others. For 33 years. Tom Alkazin has been in love with Network Marketing. He had no other career. Tom is an excellent presenter and featured in many corporate video's. After starting in Vemma in 2006, within 24 months they build up a team of 40,000 members that reaches through every state and country in which Vemma operates. Within these 2 years they made $2.1 million. 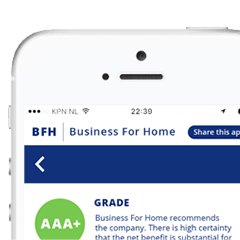 Brad Alkazin, Tom and Bethany's son, reached one of the top position's within company which makes it a real family business, one of the advantages of Direct Selling. 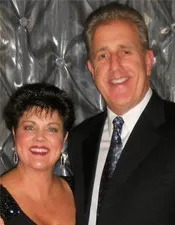 Tom and Bethany have over 200,000 distributors and customers who have enrolled in their organization, with a strong presence in the USA, Asia and Europe. There has been well over $200 million in sales flow through their organization as a result of Tom and Bethany's decision to support BK Boreyko's startup in 2006. Nowadays Vemma Sales Revenue is around $100+ million with double digit growth figures. Tom and Bethany's team are realizing an est. 40% of the company sales volume. Who are Tom and Bethany Alkazin and how did they manage to be so massively successful? Ted Nuyten had the honor to interview Tom Alkazin. Tom, how did you got involved in the world of Network Marketing? I was first introduced to Network Marketing in August of 1975. I was 23 and single and had been working for one year out of college as a computer programmer. I was sitting at work one day and a friend of mine's mother called me and asked me to take her son Richard to a business meeting. I said I was not interested I was going to the thoroughbred races and then going to the beach after that she said she would buy my dinner I said –I'll go! My life was changed that night forever! I was SOOOO excited! 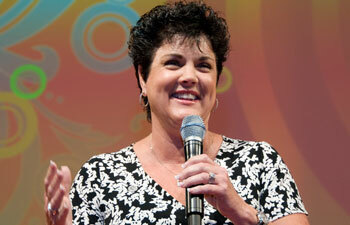 I had never heard of anything like Residual Income! The idea of being able to build something that had the ability to continue to pay me was amazing! This happened to be the Amway business and the funny thing about this is the fact that I failed at selling World's Finest Chocolate in high school! I never thought that could sell or market anything! I was so excited, I started with the hope of making $200 per month. I thought if I could earn that much, it would be wonderful! Remember, I was 23 and I had no money. While it didn't require a lot of money to begin, I wanted to do it right. I wanted to have product on hand so I went to my mother and asked her if I could borrow $1000, I promised to pay her back and she said yes! You started your MLM career in Amway, who enrolled you in Amway and is that person still involved in MLM? I started in Amway in August 1975. I was enrolled by a friend of mine from High School by the name of Richard. Richard quit the business after less than one year! Big mistake! Who have been your mentors or inspirators? I have been so very fortunate to have been exposed to and mentored by some great people! I have always believed that a person's business will ONLY grow as fast as they grow as a person in other words, personal development is crucial! I was exposed early on to all of the greats in this arena! Jim Rohn, Brian Tracy, Bob Proctor and Les Brown have made a huge impact on my life. Whenever I drive, I am always listening to CD's by these great mentors! It has been, by far, the BEST investment I have ever made in my business, i.e. investing in my own growth as a person! Now, on a personal level, Ben Boreyko Sr (BKs' Dad) was the man I always studied carefully and watched. I always watched HOW Ben dealt with people. His love and genuine caring for others made him, in my opinion, one of the greatest networkers of all time! When did you meet BK Boreyko and why did you decided to join forces with him? I first met BK 33 years ago when Bethany and I were still in the Amway business. We became very close friends with Ben and Dottie Boreyko (BKs parents) when we began to speak for their group and they in turn spoke for our group. I met BK when he was just 17 years old. There was something special about this young man. His positive attitude and his fun loving spirit was something that he clearly had learned from his father. We decided to join forces specifically with him in 1987 when he became our sponsor in Matol Botanical. Bethany and I decided to join forces with him because of who he was and the great family that he came from! There is a lot to be said for honesty, integrity and a genuine caring for people — that is what BK is all about! Did you enroll massive members in Vemma or do you have a more selective strategy? We have never been great enrollers. We have averaged about 1 person per month over the last 7 years. Our strategy in enrolling is very simple and yet very effective — we look for and work with only those people that have a genuine desire for change in their lives. Obviously, there are thousands in our business who are not that motivated to change the condition in their life and we of course, welcome them as well! But when it comes to our time —we have to be selective and spend the majority of our time with those who really want to build! You have an international down-line with a strong presence in Europe. Is there a cultural difference in MLM entrepreneurship in the USA and Europe. Being so blessed to have people all over the world on our team, while there are clearly cultural differences between countries, one amazing part of the MLM world is that MLM entrepreneurs all the same wherever I go! The successful ones are always people who have a very genuine and caring attitude for others. If you do not, you never succeed in this industry in the long term. Yes, you can make a lot of fast money no matter who you are but IF you want long term, stable residual income , you must get your eyes off of yourself and on to the other person. You must have burning desire to help others succeed. Your previous opportunities where not binaries but break-a-way's. Do you prefer a binary more? If so why. Our history in terms of compensation prior to VEMMA has always been uni-level plans with some form of a break-a-way feature. VEMMA is our first binary compensation plan. Which do I prefer? let me just say this, we have never been more successful financially than what we have right now with VEMMA. The team building aspect of our compensation plan creates such an amazing level of excitement! 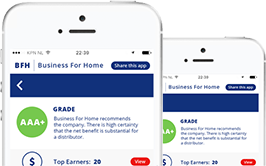 There is an amazing balance between immediate income for the newest person and tremendous long term income for those that want to earn the big money! Which countries / territories do you think will have the largest growth rate in the near future, USA, Asia, Russia, Europe ect. The future is so very bright for our industry! The worldwide economic problems are driving people right into our business! People realize they MUST take control of their own financial future! I see tremendous growth coming in the next 5 to 10 years from both Europe and Asia. People everywhere need to make more money but these two parts of the world are going to be huge! You are a very success full distributor, do you still get rejection? If so, how do emotionally handle this? Or is recruiting easier if you are a MLM millionaire? Bethany and I both still experience rejection everyday and every week! It is obviously easier to tolerate when you are successful. However, in becoming successful I had to learn how to handle this thing called rejection. Here's what I did: I have always believed that I needed everyone BUT I DO NOT need any one specific person! We made up our minds a long time ago, that no one person was going to stand in the way of us achieving our dreams! Every rejection meant I was one person closer to someone who really wanted to change their life and would do it with us. For a new person coming into this great industry, I would suggest that you never, never, never give up on your DREAMS! Your why or what you want this industry to do for you and your family is the ONLY thing that will sustain you! Guard it and protect it! And then go and stay plugged in to your up-line leadership and do something positive EVERYDAY to advance your business!